On 13th December last year, during the opening weekend of the newly constructed New Testament Church Of God building in Handsworth, Birmingham, a piece of British gospel music history was commemorated. On that memorable evening The Majestic Singers had a rafter-raising reunion concert and Kingship Records launched a reissue of one of the seminal British gospel albums The Majestic Singers' 'Free At Last'. In the 1970s British gospel could boast only a few choirs such as The Latter Rain Outpouring Revival Choir (from whence sprang London Community Gospel Choir's Bazil Meade) and The New Jerusalem Choir. Then in 1974 District Youth Director Justin J Lewis and choir director Paulette Harley carefully selected 26 singers from The New Testament Church Of God congregation. It was Lewis' dream to bring to the black choir genre something that was peculiarly British. Said Paulette Harley, now Paulette Peters, who today resides in Northampton, "As choir director, one of the first decisions I made was that we not be a mass choir but a group of harmonised voices; hence we settled with the name The Majestic Singers rather than The Majestic Choir, which was one of the first suggestions." The choir quickly became regulars at local events and major NTCG conventions throughout England and in Maxine Simpson the group had located a fine lead singer. In the early years of British gospel development the Christian record companies were extremely slow in recognising the consummate singing talent within the UK's black majority churches, but that changed when, in 1978, a young Irish recording engineer, record producer, bass player and black gospel fan, Les Moir, hearing enthusiastic reports about the choir, took a trip to the NTCG building. Moir recounted how he was shown into a church side room where Maxine, Paulette and a 13 year old pianist Steve Thompson were present. Les's jaw hit the floor when he heard the astonishingly accomplished playing of Thompson while Maxine's voice left Moir in no doubt that here was a talent worth recording. Admitted Paulette, "I think that there was just some natural talent within the group. Maxine had a natural singing voice, and where she sang, you know, people's jaws did drop. I do feel that Steven also had this natural musical talent, and when we put it all together it was a unique sound." 'Free At Last' was produced and engineered by Les Moir and Helmut Kaufmann at Eastbourne's ICC studio. As well as the precocious Steve Thompson (who was later to find fame working alongside Graham Kendrick) playing on the record the album also featured guitarist Joel Edwards, then of the pioneering gospel crossover band Kainos, and who was, decades later, to head up the Evangelical Alliance. Maxine Simpson, now Maxine O'Connor and living in the USA, told author Steve Alexander Smith in his book British Black Gospel, "We all turned out on a very snowy evening. It was cold outside but we were very excited at the prospect of the record. Les Moir, the recording engineer, turned up that night and put us at ease with his professionalism. It was when we were touring Germany at a later date that we first had the opportunity to listen to the finished article; I must say, we were very pleased." By 1982 all kinds of opportunities were opening for The Majestic Singers. They played the Greenbelt Festival, traveled to several big cities and played concerts in several European countries. Also in '82, Kingsway Music released the album 'Maxine And The Majestics'. At The Royal Albert Hall the choir shared the limelight with Cliff Richard and US gospel stars Danniebelle Hall, Jessy Dixon and the Hawkins Family. 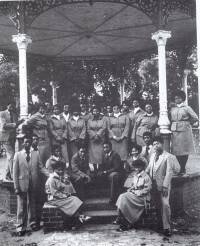 The choir's founder, Justin Lewis, produced an album by The Gospel Foundation Singers, an all female group from Rugby, while other UK groups and choirs including The Singing Stewarts, The Merrybell Gospel Choir, The Wades and The Highgate Choir all benefited from The Majestics/NTCG's business arm Majestic Promotions. Maxine O'Connor recalled her glory days with the choir. She told Steve Alexander Smith, "I had so many wonderful experiences with The Majestic Singers that it is difficult to choose any one of them as the greatest memory. Each experience exposed me to a world I would never have been aware of, had it not been for the group. However, the trip we made to America in 1982, especially our visit to Kansas at the General Assembly, ranks as one of my most memorable." Maxine continued, "We were guest singers at The Talent Show singing 'My God Is Mighty' (for which they received a standing ovation) and ministered with The Lee Singers through the song 'Tell Them' by Andrae Crouch, at the Mission Service. I was asked to sing the lead. It was an incredibly moving experience. We also traveled extensively throughout England, Wales, Scotland and Germany. Singing with The Majestic Singers was an awesome experience for me." The Majestics' third and final album 'Look Where' was released on UK Word's Myrrh label. It was recorded at Birmingham Central Hall on 3rd November 1984, a concert that commemorated the choir's 10th anniversary. Recounted Steve Alexander Smith, "They showed their appreciation for Justin Lewis by presenting him with a special award for all he had achieved during that time. Later that year, he emigrated to Fort Lauderdale, Florida. With the departure of Lewis and Maxine, the choir had lost its heart and soul but continued to perform. The line-up changed several times over the years; it even included members from other denominations, which was unusual at the time. A number of members continued to drive the group forward, including Justin's two children, Mark and Sophia. Other notables include Carol Riley, Jenifer Channer, Fay Beason and Dorothy Butler. Despite this, the curtains came down for the final time in 1988." British gospel has, of course, moved on a long way since The Majestic Singers' pioneering concerts and recordings. However, as the throng who packed NTCG's pristine new building will testify, their contribution to the development of the British gospel scene has not been completely forgotten. As Bishop Dr Derek Webley MBE, Senior Pastor of The New Testament Church Of God said, "The release of the album in 1979 was groundbreaking for UK gospel music." Peter Timmis is a regular contributer to Cross Rhythms and lives in Stoke-on-Trent. I remember listening to a cassette in the early 80's by the Majestic Singers. On it was 'My God is Mighty'. I played it over and over again. I gave it to someone who I knew needed spiritual uplifting, thinking that I would be able to buy myself a replacement. I have tried to get hold of a copy, but to no avail. Does anyone know how or where I might be able to get it. It really blessed me then as I knew that was my turning point in life. God is to be praised. I first bought free at last in 1981 when I was just aged 16! I loved and played it so much that I wore the record out! I moved to Sheffield over 20years ago n still love thus album! I am so pleased that I am able to buy it in cd and aim to do so soon and very soon! Thank you for a wonderful album which has given me so much joy! I know each and every track word for word! Yes there are other gospel artists out there but non can compare to the majestic singers! The majestic singers are still going, and still perform. there lastest perfomance was at the New Testament Church of God in Lozells Birmingham, and Maxine was there. The Majestic Singers to perform again; re-issue 1979 album.